Here at Hog Roast Caistor, we reckon the town has seen plenty of roasts over the years. It was originally a Roman fortress (the name comes from ceaster, which means a Roman camp or town in Anglo Saxon), and of course a hog roast is a great way to feed a crowd. There’s plenty of history left behind in the town, like fragments of the 4th Century walls, and the area of the fortress is a Scheduled Ancient Monument. Caistor itself is a Georgian and Victorian Market town, and still boasts its market square. Places that wear their history proudly are great places to cater, because often historic buildings – Caistor has 56 Grade 2 listed buildings in the market square alone – are converted into fantastic pubs. There’s nothing quite like a pub with exposed beams, original stonework, or an inglenook fireplace, reminding us of older times when roasting meat over an open fire was a common method of cooking. We don’t do this now, since our machines are stainless steel and gas powered which is both safer and more hygienic, but the smell of slowly roasting meat drifting through can really evoke a sense of the past. As well as making everyone hungry! 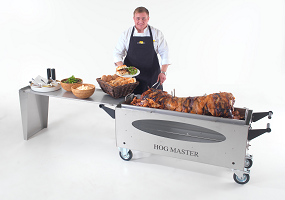 Once the roast is cooked, everyone can see the chef carve the juicy meat and crispy crackling. This only heightens expectations, since it’s so tender it practically fall off the bone. At Hog Roast Caistor we often cater for pub events, and it’s great to see the customers’ reactions to something that they don’t usually encounter. Often people haven’t ever seen a pig roasted in its entirety before. It’s truly a different experience to taking a joint in a roasting tin out of a household oven. While the chef carves, other staff are busy piling the pork into rolls with sage and onion stuffing, apple sauce, and crackling. It makes an excellent sandwich that’s full of contrasts – sweet sauce and savoury stuffing, tender meat and crunchy crackling, hot meat and cold bread. It’s absolutely divine, even if we do say so ourselves. Given the compliments our chefs get, we’d say our customers agree. Whether it’s a pub, a garden party, or a wedding, we have something to offer everyone. Because we understand that not everyone eats pork, so we also offer options like lamb or beef for those who want a kosher or halal roast. We can offer vegetarian options, as long as they’re mentioned in advance. In fact we know of a wedding hog roast where the roast was the only part that catered for vegetarians, nobody having informed the venue of the afternoon meal they needed to! Having vegetarian options really saved the day, and stopped there being a lot of upset guests. Because of this, at Hog Roast Caistor we like to be flexible. Along with flexible menus, our machines are designed to be lightweight and cope with a variety of locations. If you can think of it, we’ll do our best to accommodate you.